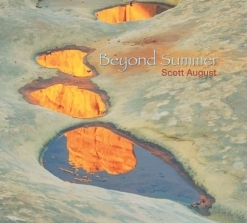 Before I go into any details about Scott August’s seventh album, Beyond Summer, I just want to say that I really love this album! A multi-instrumentalist known primarily for his evocative Native American flute playing, August performs on a variety of instruments that include world flutes, guitars, pianos, percussion and ambient textures. 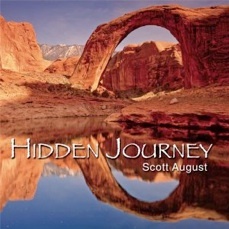 Flutes - especially Native American flutes - can sound mournful and haunting, but August expresses a range of moods and emotions from upbeat to more ambient and dreamy. I found it very interesting to learn that August arranged these pieces to allow him to play several instruments at once by looping and layering the parts in real time. August’s music has been featured on nationally syndicated “terrestrial” radio shows as well as on several digital networks. His albums have garnered many awards including the prestigious Native American Music Award (NAMMY), an Indian Summer Music Award and two Zone Music Reporter Awards. In addition to his seven albums, August is the author of four books on Native American flute playing. Beyond Summer begins with my favorite track on the album, “Spirit of the Canyon.” After a dark and mysterious intro, the rhythm starts to build to a driving beat that supports Native flutes, kalimbas, marimbas, and the Oud. Both carefree and very visual, this wonderful piece could have been inspired only by the southwestern US - it just sounds like that part of the country! I could listen to this one all day! “Empty Highways” refers to the many hours spent on the road traveling from gig to gig as well as the fact that those trips are usually made alone. Relaxed and somewhat bittersweet, Native flute, hammered dulcimer, guitars, keyboard and percussion effectively create visual images of wide open spaces and feelings of solitude. “High Desert Dreams” is a soothing mind massage as well as a meditation on the open lands of the Colorado Plateau. It is performed on a re-creation of an ancient Pueblo flute that dates back to 650 AD. In addition to the flute, Pan drums, acoustic and pedal steel guitars and percussion exude a mood of peaceful serenity. The title track was created with layers of drums, African kalimbas, bass and floating pads to support the melody performed on Native flute and piano. The piece is calming while conveying the feeling of moving forward with a purpose. What would a dancing buffalo look like? Perhaps rather slow and heavy, while expressing a form of joy? That’s the image I get from “Buffalo Dance.” Performed on three Native American style flutes that are looped over an infectious beat, it’s another favorite. The gorgeous “Valley of Gold” expresses a powerful message about the beauty of the world and how it is disappearing. Scott August explains: “The Valley of Gold is a real place. Once it was the home of giant saguaro cactus, coyotes, jack rabbits, quail and other natural desert dwellers. Now it is all subdivision and asphalt.” Slow and mournful, its heartbreaking music matches the message. “Journey to Kashgar” takes us to an exotic town along the Silk Road. One of three pieces performed on the Chinese Xiao flute, the “Eastern” feel of this piece is a wonderful contrast to the more “Western” Native American style flutes, and yet it fits the album so well. “Shadow of Time” is performed on piano, guitars and textures (no flutes). Composed on a dark snowy day, it is reflective, but also expresses the joys and pain of life and the relentless quality of time. More ambient than most of the other pieces, it’s a lovely close to an exceptionally good album! Beyond Summer is currently available from www.CedarMesa.com and I give it an enthusiastic two thumbs up!